Coated steel canister containing 750 Grams of Indicating Orange Silica Gel, perfect for: Boats, RV's, Cars, Gun Cabinets, Safes, Closets, Storage, Cabinets, Scuba Gear, Camera Equipment, etc. 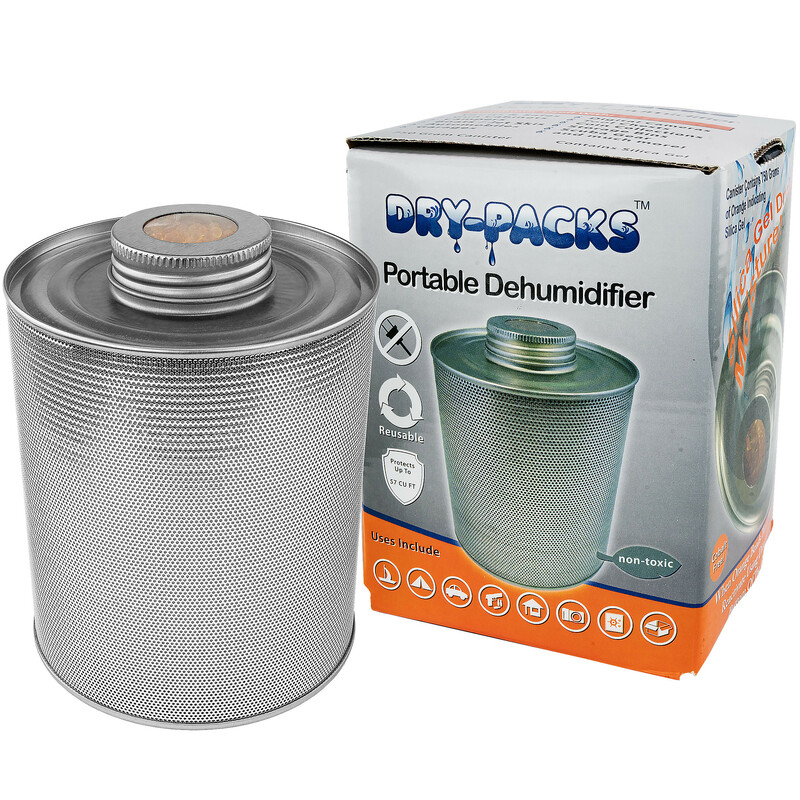 Dry-Packs Steel Dehumidifier Canister contains a large volume of Silica Gel (750 grams), Sturdy Construction, Portable, & Electric Free (NO CORDS)! Using top grade orange indicating silica gel in a compact and portable aluminum canister makes it one of the most versatile desiccant products on the market that is easy to reactivate. Dry-Packs Dehumidifier Canister provides a lifetime of protection for your gun case, ammo storage, electronics, camera bag, shoes, tool boxes, cabinets, drawers, tackle box, backpacks, camping gear, RV's, trailers, storage bins, coin collections, craft supplies, etc. It's built-in indicator will turn from Orange to Dark Green signaling a need for reactivation. It can be reactivated in the oven and reactivation instructions are right on the unit. This item is direct from the manufacture and is in stock and ready to ship!